Are osteoporosis guidelines influenced by “Big Calcium” and “Big Vitamin D”? 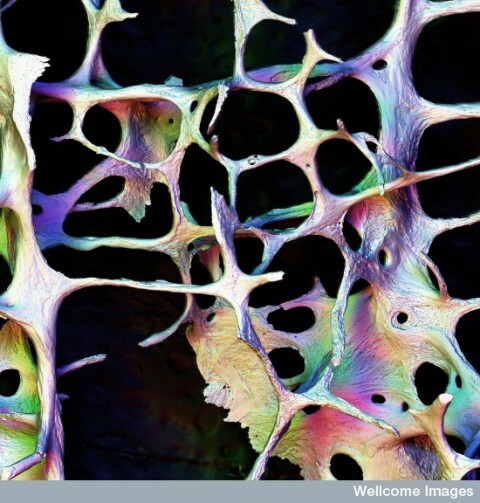 Osteoporotic bone. Are the mainstay treatments for osteoporosis prevention, calcium and vitamin D, truly useless? For many years, recommendations for prevention and treatment of osteoporosis have included increasing calcium intake (by diet or supplements) and use of vitamin D supplements. Since the average dietary calcium intake in most countries is much less than that recommended by guidelines, many older people are advised to take calcium supplements to prevent osteoporosis. The recommendations have been implemented successfully: over half of older Americans take calcium and vitamin D supplements, either prescribed or over the counter, and bone health is the most common specific motivation for use of nutritional supplements. However, this behaviour does not reflect evidence that has emerged since 2002 that such supplements do not reduce the risk of fracture and may result in harm. Guideline bodies also continue to recommend calcium and vitamin D supplements. Here, we argue that change is made difficult by a complex web of interactions between industry, advocacy organisations, and academia. Osteoporosis is a medical condition for which supplements have been considered an accepted part of conventional medicine for some time. Are conflicts of interest trumping good science? And are calcium and vitamin D supplements truly useless? Like many clinical questions, there is evidence to support a range of opinions, and it’s very difficult to state, with certainty, that one position is the correct one. Despite this, that’s the case that Grey and Bolland make in their analysis. Strong bones are less likely to break. Our bone density peaks when we’re young, and then starts declining. Osteoporosis describes a reduction in the strength and density of the bone, as well as changes in the architecture of the bone itself. We care about osteoporosis because hip fractures and other bone fractures are more likely when bones are weak. Fractures, particularly in the elderly or already debilitated, can lead to reduced mobility issues, disability, and even death. Consequently it’s a significant public health issue, with millions of fractures per year causing hundreds of thousands of hospitalizations. These events significantly impair or reduce quality of life, as well as costing health systems billions. Once osteoporosis is already present, treatments can slow the decline or reduce the risk of fracture, but can’t be expected to restore bones to pre-osteoporosis levels. Consequently there has been tremendous research and medical interest in trying to reduce the likelihood of osteoporosis, with the overall goal of reducing the incidence and consequently the harms that result from fractures. Your future fracture risk is based on your age, your measured bone mineral density, and other factors, some of which can be modified. Drug therapy is usually recommended when the risk of fractures is high, and I won’t discuss those treatments here. In those with low fracture risk, preventative strategies are usually recommended: regular exercise, moderate alcohol/caffeine, and ensuring the diet contains adequate calcium and vitamin D. Given not everyone consumes adequate calcium and vitamin D in their diet, supplementation has been evaluated in clinical trials. While the number of studies is large, these studies have been complicated by the acknowledged difficulties in measuring dietary habits within a clinical trial. Calcium and vitamin D support the production and maintenance of the skeleton. Calcium is the major mineral in bone. Dietary guidelines for all ages emphasize the importance of dietary calcium as an essential component (along with physical activity and lifestyle factors) of life-long behaviours to promote bone strength and density. While the evidence does not support increasing dietary calcium to reduce fracture burden, it’s also acknowledged that this evidence is confounded by the challenges in measuring daily intake based on self-reported data. In general, calcium supplements are considered unnecessary if adequate amounts are consumed in the diet, which is possible with most diets (even for those that do not consume dairy). Vitamin D is also important for normal bone development. A deficiency of vitamin D causes the bone-softening disease rickets in children, by reducing the absorption of calcium in the diet (osteomalacia in adults). The elderly and the debilitated may have low levels of vitamin D owing to dietary deficiencies as well as a lack of exposure to sunlight. With vitamin D, the necessity of supplements is less clear, but is typically unnecessary except where there is inadequate intake. In some countries, food (e.g., milk) may be fortified with vitamin D. It has long been hypothesized that vitamin D supplementation may reduce the risk of osteoporotic fractures, and there’s been interest in the role of supplements, particularly in those that may not obtain adequate amounts through diet or through sun exposure. What’s the level of evidence for calcium and vitamin D? By the end of 2010, 14 large (>1000 participants) randomised trials of calcium supplements, vitamin D supplements, or their combination had been published: three reported reduction in fracture risk, nine no effect, and two increased fracture risk (figure⇓). Among 24 small randomised trials, 21 found no effect. Meta-analyses of these trials, when analysed by intention to treat, report either no effect on fracture risk or marginal risk reduction of doubtful clinical importance. A trial sequential analysis reported last year that sufficient evidence is available to conclude that vitamin D with or without calcium does not reduce total fracture risk by >10% and that additional trials are unlikely to alter that finding. Randomised trials of the effect of food sources of calcium have not been conducted, but observational evidence does not suggest that increasing dietary calcium intake reduces fracture risk. We conclude that increased calcium and vitamin D intake should not have been recommended for older adults living independently after 2007, a view consistent with the conclusion of the 2009 Cochrane review. Frail older people confined to institutions may sustain fewer hip fractures if given vitamin D with calcium. Vitamin D alone is unlikely to prevent fracture. Overall there is a small but significant increase in gastrointestinal symptoms and renal disease associated with vitamin D or its analogues. Calcitriol is associated with an increased incidence of hypercalcaemia. Vitamin D alone is unlikely to prevent fractures in the doses and formulations tested so far in older people. Supplements of vitamin D and calcium may prevent hip or any type of fracture. There was a small but significant increase in gastrointestinal symptoms and renal disease associated with vitamin D and calcium. This review found that there was no increased risk of death from taking calcium and vitamin D.
There is high quality evidence that vitamin D alone, in the formats and doses tested, is unlikely to be effective in preventing hip fracture (11 trials, 27,693 participants; risk ratio (RR) 1.12, 95% confidence intervals (CI) 0.98 to 1.29) or any new fracture (15 trials, 28,271 participants; RR 1.03, 95% CI 0.96 to 1.11). There is high quality evidence that vitamin D plus calcium results in a small reduction in hip fracture risk (nine trials, 49,853 participants; RR 0.84, 95% confidence interval (CI) 0.74 to 0.96; P value 0.01). In low-risk populations (residents in the community: with an estimated eight hip fractures per 1000 per year), this equates to one fewer hip fracture per 1000 older adults per year (95% CI 0 to 2). In high risk populations (residents in institutions: with an estimated 54 hip fractures per 1000 per year), this equates to nine fewer hip fractures per 1000 older adults per year (95% CI 2 to 14). There is high quality evidence that vitamin D plus calcium is associated with a statistically significant reduction in incidence of new non-vertebral fractures. However, there is only moderate quality evidence of an absence of a statistically significant preventive effect on clinical vertebral fractures. There is high quality evidence that vitamin D plus calcium reduces the risk of any type of fracture (10 trials, 49,976 participants; RR 0.95, 95% CI 0.90 to 0.99). While the review didn’t find evidence of overwhelming efficacy, the authors conclude that calcium and vitamin D does have an effect. They note that side effects are modest and manageable, which is reassuring given recent concerns raised about cardiovascular harms. Differences of opinion, or conflict of interest? We searched the websites of key commercial and advocacy organisations and specialist societies to determine the extent of these interests. Grey and Bolland describe calcium and vitamin D supplements as “very profitable” and then cite sales figures – but not actual profits. I have to admit that I laughed out loud when I read this statement. In Canada, calcium and vitamin D are among the least expensive supplements you can buy. While global sales of calcium ($6 billion, 2013) and vitamin D ($748 million, USA, 2012) look impressively large, there’s no evidence that they are excessively profitable, especially compared to the drug products used to treat osteoporosis. It’s also notable that the major treatment guidelines recommend supplements only where calcium and vitamin D dietary requirements cannot be met through a normal diet. Supplementation, when it is recommended, is necessary only to achieve the recommended daily intake. Grey and Bolland also cite the benefit of supplements to labs that test vitamin D levels. While there has been a surge of interest in vitamin D testing as interest in the therapeutic use of this vitamin has grown, Gray and Bolland offer nothing more that growth in utilization as suggestive of a conflict of interest. There’s nothing conclusive provided that links the two. Is there evidence of a conflict of interest here? Grey and Bolland examined the websites of the National Osteoporosis Foundation and the International Osteoporosis Foundation, and suggested that the objectivity of these organizations “may be compromised” by the range of commercial sponsors that support them, which they note include pro-supplement organizations like the Council for Responsible Nutrition as well as food companies like Nestle and Danone. They don’t discuss the numerous pharmaceutical company sponsors that these associations also attract. To be clear, conflicts of interest can be very real. But other than identifying the fact that sponsorship is occurring, Grey and Bolland offer no further argument to demonstrate that the objectivity of these associations are actually compromised. The evidence seems to be restricted to the fact that their treatment guidelines have made a different recommendation about the role of calcium and vitamin D supplementation. Grey and Bolland note that the two major osteoporosis foundations have not changed their position despite the conclusions of the US Preventive Service Task Force panel, which in 2013 recommended that neither calcium nor vitamin D supplements are necessary in most older adults. Is this due to a conflict of interest? Or is it simply a differing view of the evidence regarding supplementation? Given the evidence remains strong enough for the Cochrane Collaboration to conclude that supplementation has modest effectiveness, it seems a stretch to say (as Grey and Bolland do), that “calcium and vitamin D do not safely reduce fracture risk”. Grey and Bolland then turn their focus to the interrelationships between researchers and funders that may have vested interests in specific findings. Again, conflicts of this type can be real, and so can publication bias, where positive studies are more likely to be published. They list several examples which they believe provide evidence to support their assertion that industry relationships are poorly disclosed and may be influencing guidelines. But again they provide no actual evidence to demonstrate influence is real. The authors conclude that the interrelationships between industry, academia, and advocacy organizations provide benefits to all parties at the price of overtreatment, wasted health resources, and ultimately, eroded trust. All of which can be real. But is this really the reason that vitamin D and calcium are in osteoporosis treatment guidelines? Grey and Bolland believe that there is a web of industry, advocacy and academia that keeps vitamin D and calcium in osteoporosis treatment guidelines. They do not believe these products have any value in the prevention and treatment and osteoporosis, and this, they conclude, must be the reason that they persist in the guidelines. Taking out Occam’s razor, I can describe a second scenario, which I think is more plausible. The role of calcium and vitamin D in the prevention and treatment is indeed controversial. However, there is adequate evidence of sufficient quality that even groups like the Cochrane Collaboration acknowledge that vitamin D with calcium offers a real (albeit modest) reduction in hip fractures and other fractures. And while there have been some worrying safety signals with calcium supplements, there have been no conclusive harms shown with a strategy of maximizing consumption via dietary sources. Given the modest benefits, low cost, and relative lack of side effects, vitamin D and calcium continue to remain a component of osteoporosis treatment guidelines. Are there inappropriate influences at work here? There may be, but little convincing evidence has been provided. Overall, I find the arguments from Grey and Bolland to be weak, and find myself in the rare situation where I continue to see a potential role for supplements as a part of science-based care. Photo from flickr user Wellcome images used under a CC licence. ← Pine bark and ginkgo for tinnitus? A closer look at “Ear Tone”, a supplement marketed to treat tinnitus. I think all this info is valid, however there are other benefits for taking vitamin D aside from osteoporosis. I am a cancer survivor, and because my level was almost nonexistent when I was diagnosed with cancer, I never miss a daily dose. Was the low level caused by the cancer? No one can say, but low is low and I don’t intend to register a low reading again. Due to my treatments and chemical menopause due to chemo, I am also at risk for osteoporosis, and in addition to the PLANT-BASED calcium (very important to be plant-based in that the calcium carbonate and calcium citrate from shell and stone are not metabolized the same) and vitamin D, I also take vitamin K as MK-7. K is the missing link in getting the calcium into the bone so it’s not surprising that studies done when the participants just take calcium and/or D with out K don’t show beneficial results. In Europe and the middle east, post menopausal women are routinely given supplements which contain Calcium, Vitamin D AND vitamin K in one pill. Ask doctors about vitamin K in the US and they don’t even know what it is. I suggest your readers pick up “The Calcium Paradox” by Rheume-Bleu. Forget the supplement industry…look at the bisphosphonate industry and you’ll see some substantial motivation to keep those fractures (and fear) going. Here is a good review of the science on Vitamin K, which notes that the evidence is far less convincing. The promotion of calcium for the bones is predicated on the FDA allowing claims of “support” for the bones following the passage of the Dietary Supplement Health and Education Act of 1994. The act allows the sale of supplements based on meager evidence of benefit. According to an estimate by a U.S. consultant to the Industry, if well controlled trials were required before claims were allowed, 80% of the dietary supplement industry would vanish, putting 1000s out of work.